At the Farnborough Air Show, plans to build a dedicated launch facility were unveiled. The UK government has expressed its enthusiasm for this unlikely project. Of the sites revealed by he CAA, one site is in England, at Newquay. One site is in Wales at Llanbedr airport in Snowdonia national park. The other six are in Scotland: Campbeltown airport; Prestwick airport; Kinloss barracks; RAF Lossiemouth; RAF Leuchars and Stornoway airport on the Isle of Lewis. Publication of the shortlist has led to a scramble among the sites to win government backing. The Scottish government in keen on the idea, for the kudos of being seen to be a space nation. Operators now enter three months of consultation before the decision is made.The airports considered have to have long runways and have airspace that can be easily segregated to allow spaceplane flights to operate alongside normal aviation. Sites have to be remote from population, on the coast to minimise the risks from “down-range abnormal occurrences” – meaning spaceplanes crashing or bits falling off. Space travel is the highest carbon activity known to man; worse even than Formula One racing or using private jets. Never mind Cape Canaveral, we could soon be talking about Cape Campbeltown or Cape Cornwall. Britain’s own space race got under way on Tuesday with the announcement of eight sites that will now vie for the right to build the UK’s first commercial spaceport. Plans to build a dedicated launch facility were unveiled at Farnborough airshow as an ambitious bid to transform Britain from a nation that has never seen a spacecraft launch from its own soil into a leading space nation. Six of the venues under consideration lie north of the Scottish border, where the Civil Aviation Authority (CAA) named Campbeltown airport, home of the Mull of Kintyre music festival, and Glasgow Prestwick airport, the only place where Elvis is proved to have set foot in the UK, as contenders. The other Scottish sites are Kinloss barracks, a former Nimrod patrol base; RAF Lossiemouth, a home for fast jets; RAF Leuchars and Stornoway airport on the Isle of Lewis in the Outer Hebrides. Publication of the shortlist has led to a scramble among the sites to win government backing. Operators now enter three months of consultation before the decision is made. Newquay airport in Cornwall and Llanbedr airport in Snowdonia national park are the only sites in England and Wales to make the list after officials reviewed the suitability of all the military and civilian aerodromes in the country. The sites under consideration have long runways and airspace that can be easily segregated to allow spaceplane flights to operate alongside normal aviation. Another attractive feature is distance from dense populations – with sites preferably on the coast – which officials say minimises the risks from “down-range abnormal occurrences” – meaning spaceplanes going awry. The government asked the CAA in 2012 to review how Britain could capitalise on the surge of interest in spaceplanes to take tourists to the edge of space on sub-orbital flights, to deliver satellites into orbit, or to perform scientific experiments. 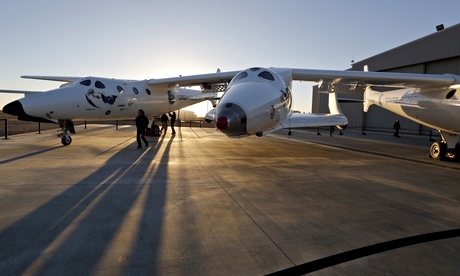 In its report, the CAA states there is genuine appetite to begin spaceplane operations in the UK by 2018 or earlier. Spaceplanes have wings and act like normal aircraft in the atmosphere, but have rockets to propel them into space. The technology is largely untested. According to the CAA report, they could be a thousand times more dangerous to fly in than commercial airliners. The higher risk means spaceplanes would have to be designated “experimental aircraft” to fly in Britain, but because these are not usually allowed to carry paying passengers, space tourists would need to have the risks explained to them and give written consent before flying. “In doing so, these paying participants will also acknowledge and accept that they will not benefit from the normal safeguards expected of public transport,” the report says. Wherever the spaceport is based, the operator must draw up what the CAA calls “full contingency plans” with the health and emergency services to deal with “major incidents”. There are other challenges too. More than 2m flights passed through UK airspace last year. To avoid interference, spaceplanes would at first have to fly in segregated airspace, and none exists around any of the shortlisted aerodromes. The CAA says that protected airspace will have to be carved out, perhaps by designating a Temporary Danger Area around the spaceport, again favouring sites near the coast. Andrew Nelson, president of the California-based company, XCOR, said that 300 people had already booked for a spaceflight experience aboard its Lynx spaceplane. The two-seater plane takes-off under rocket power and has room for a pilot and a paying passenger. The company is offering half hour sub-orbital flights to 100km and plans to begin commercial flights in the US in 2016. The CAA admits that a Scottish spaceport is likely to be affected by more rain, stronger winds and greater cloud cover than sites further south, meaning fewer flying hours for passengers hoping to see the ground from space. “The more challenging meteorological environment in these locations is, therefore, very likely to impact on the economic potential and viability of operations in these locations,” the report says. IT was once Scotland’s only departure point for transatlantic flights, but within four years Prestwick airport could become Europe’s space tourism hub after it was named among six possible sites in Scotland for a new spaceport. The Department for Transport has published its shortlist of eight locations across the UK as potential launchpads for commercial spaceflight, satellite bases and scientific research. The Scottish locations are Prestwick airport in Ayrshire, Stornoway airport in Lewis, Campbeltown airport at Machrihanish in Argyll and Bute, RAF Leuchars in Fife, and Kinloss Barracks or RAF Lossiemouth, both in Moray. Posted: Thursday, July 17th, 2014. Filed in General News, Recent News.